I’m a one woman show. Not that I want to do all this (besides write) but for the time being limited funds find me being the sole employee of Jennifer Geoghan Novels. So with this in mind, I find myself editing my own books. I’m the first one to tell you that after editing six novels, there are no short cuts if you are going to self-edit, but there are a few tricks of the trade that will help you out. After I write my first/rough draft, I print out a copy. Yes, a hard copy. Yes, it’s really long. But for me, I find I edit best on paper than just trying to do it on a computer screen. If I were you, I’d try a chapter or two with paper and pen and see if you find more things to fix. Experiment and see where you think your time is better spent. I’ll go through my book, page by page, handwriting in my changes. At the end of the day, I’ll sit down and enter my changes onto the word document so I start fresh the next morning. I’m finally finished that third run through, I do a spellcheck review in Word to see what shows up. After I’ve read through my novel at least three times this way … Yes, you heard me, three times. It’s time consuming but this is what I have to do to really self-edit. I now move onto the second phase of my process. This is where I save the word doc of my book as a web page. I then email that webpage document to my kindle. If you didn’t know, every kindle has an email address that you can use to email documents to. In my case, it was the beginning of the email I used for my amazon account, but instead of @ Hotmail.com, my kindle’s email is @kindle.com. 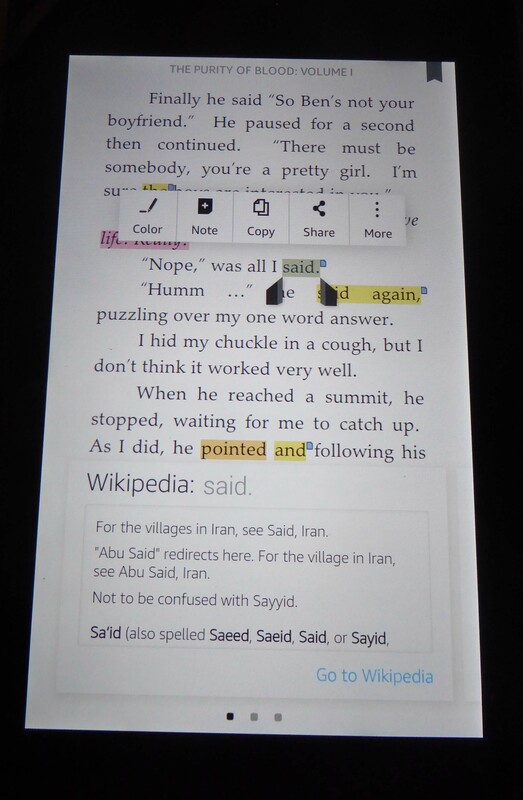 After about 10-15 minutes, you can check your kindle and the document will show up just like a new e-book on your kindle. I then utilize the text to speech function and sit back and listen to my book while I read along. You’d be amazed at how many mistakes you’ll spot when you let the Kindle to the reading for you. It’s the things like you mistyped the word “thought” as “though.” Though is a word and will never show up as a spellcheck mistake. Listening to your book will also be very helpful in the placing of commas and hearing run on sentences. The human mind has amazing capacity to just skip over missing words. Did you miss the word “an” in the last sentence? I just deleted it out! It should have read “The human mind has an amazing …” When you’ve not only written the book, but just read through it three times, believe me, you probably know parts of it by heart. That’s BAD! That means you’re too familiar with it. 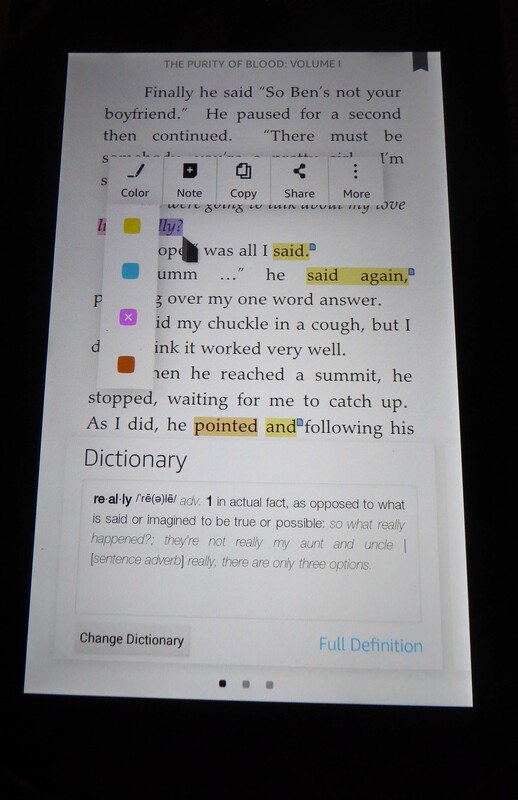 The kindle voice can be your unbiased reader. I will also add that you can just listen to the book, which is good, but I do best when I listen and read along. 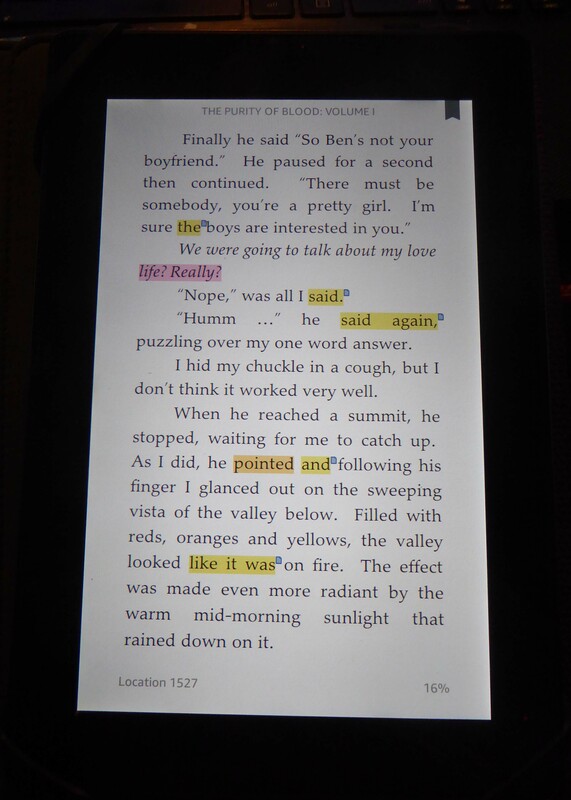 The kindle will let you highlight words, make notes, bookmark pages. I’ve done this so many times I have my own shorthand. A blue highlight means delete, an orange one means add a comma after this word, a pink one means something’s wonkey here. Could be check spelling or a word repeat. A yellow highlight means there’s a note attached. Since I do a lot of my editing on the treadmill, shortcuts like this come in handy. I’ll end with the suggestion that if you’re going to give a friend a copy of your manuscript to edit for you, be very clear on what kind of a deadline you’re working on and when you’d like to have it back. In my experience, friends often offer to help you read/edit, but they’re also going to read in a “spare time” time frame which means it could be weeks until you finish. When you’re trying to pump a book out, this can be an issue. I know when my creative juices are flowing and you’re that close to finishing, waiting around and twiddling your thumbs for a week is annoying in the extreme. 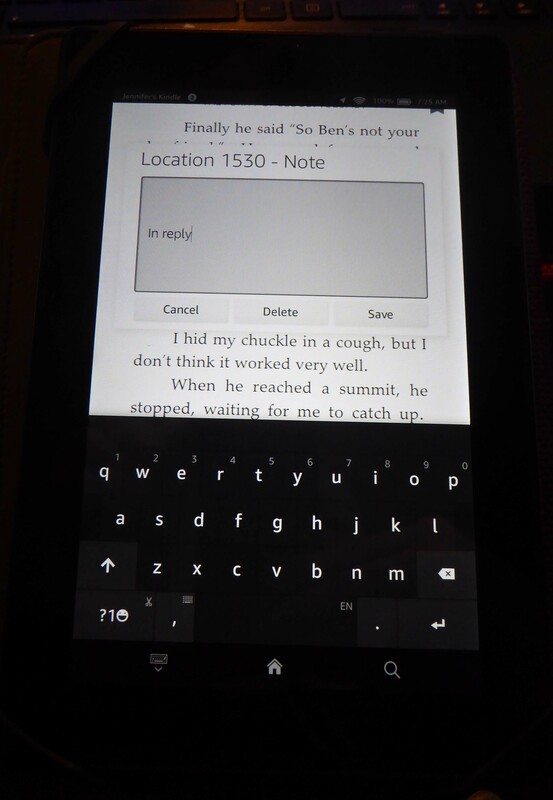 Two years ago when I first decided to publish, I bought my kindle. I only bought it because I thought I needed to know how ebooks worked to sell them. I never thought I’d actually read ebooks. Now I’m hooked on them and am always finding new ways to use my kindle. Best purchase I ever made!! I have a Kobo and I use it quite a bit, but I had to admit, I still prefer having the physical book. I’m a bit of a book hoarder though so I’m trying to cut but and only buying the book for series I’m already collecting. New authors/series start on my Kobo these days. I don’t have all the bells and whistles on my Kobo as you do on your Kindle though.